So far, we have confined our discussion to a one-product company. However, many manufacturers make more than one type of product. The relative proportion of each product sold in the aggregate sales is known as the sales-mix. 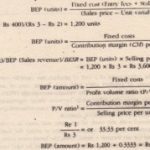 A changes in the mix of products sold usually affects the weighted average P/V ratio and hence, the BEP. Thus, when the products have different P, V ratios, changes in the sales mix/product mix will affect the BEP and the results from operation.